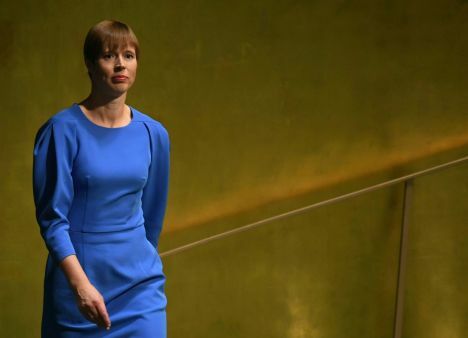 The effects of climate change are dangerous to the existence of entire peoples, Estonian President Kersti Kaljulaid has said at a meeting with the UN Secretary-General António Guterres. Estonian public broadcaster ERR reports that during her visit to the U.S. on Thur, the Estonian head of state evaluated during a meeting with Guterres: «The effects of climate change threaten the survival of entire countries and peoples». As to necessary actions in the climate context, Kaljulaid believes it is significant both to focus on the adoption of green energy and energy efficiency, as the latter is also a means of reducing the amount of carbon dioxide (CO2) being released into the atmosphere. The Guterres and the Estonian President also shared their views reforms initiated by the UN Secretary-General and how to increase the transparency and efficiency of the UN’s activities. This is simply untrue, the climate is not affected by CO2 levels. That is a fact. CO2 levels rise and fall BECAUSE of temperature change caused by the suns activity nothing else.